While we in the Midwest are sweating away the hours this summer, it may not come to mind that in only a few short months the days will be shorter and cooler, until another winter will be upon us. The age-old tradition of “putting up” jars of summer fruit not only allows you to purchase fresh fruits at their peak, but also makes them keep to be enjoyed on a colder, less sunshine-filled day. Fresh apricots right off the tree are something which has little to nothing in common with the canned version found on the grocery store shelf. 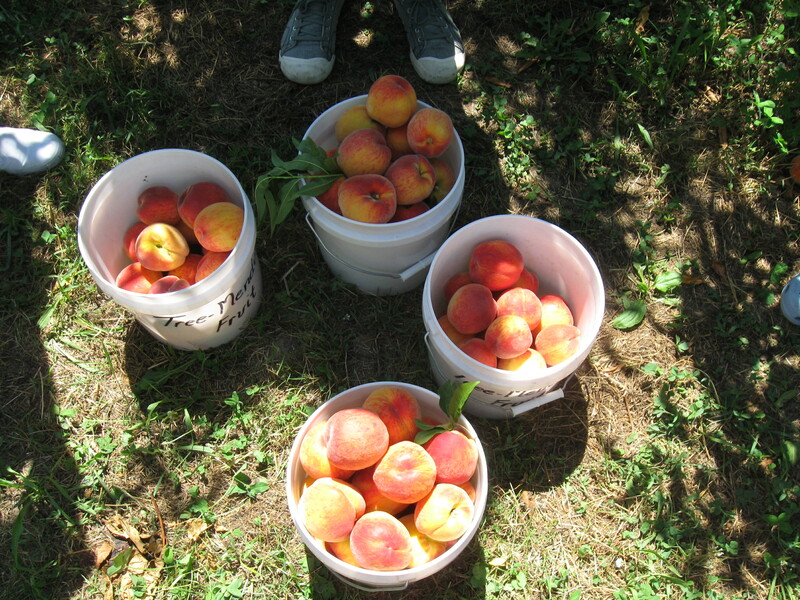 Picking sun-ripened apricots from a local grower and preserving them yourself can capture that sunshine of the summer day you picked them. First, you start with a solid source. One of my favorite Michigan farms is Tree-Mendus Fruit in Eau Claire. 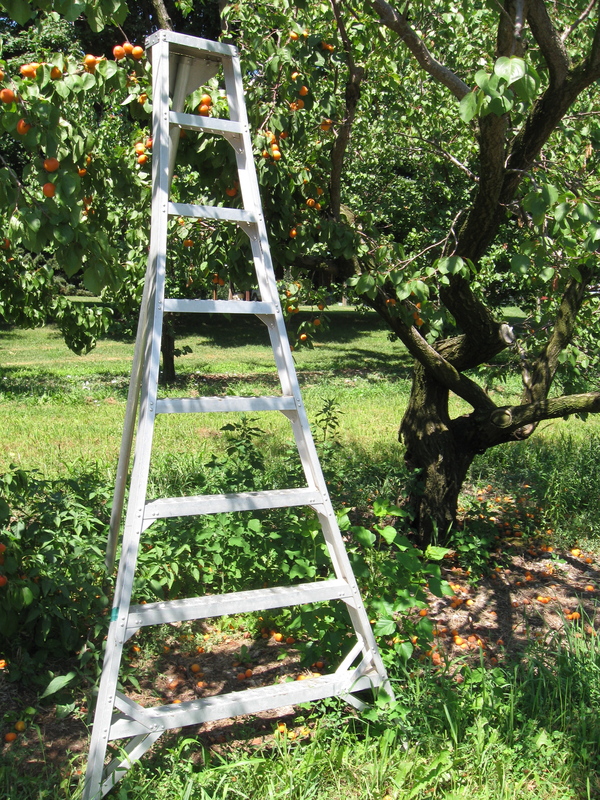 They have a variety of fruit picking options, and although I usually make a fall trek up to get some of their stellar apples, apricots are the summer fruit of choice. 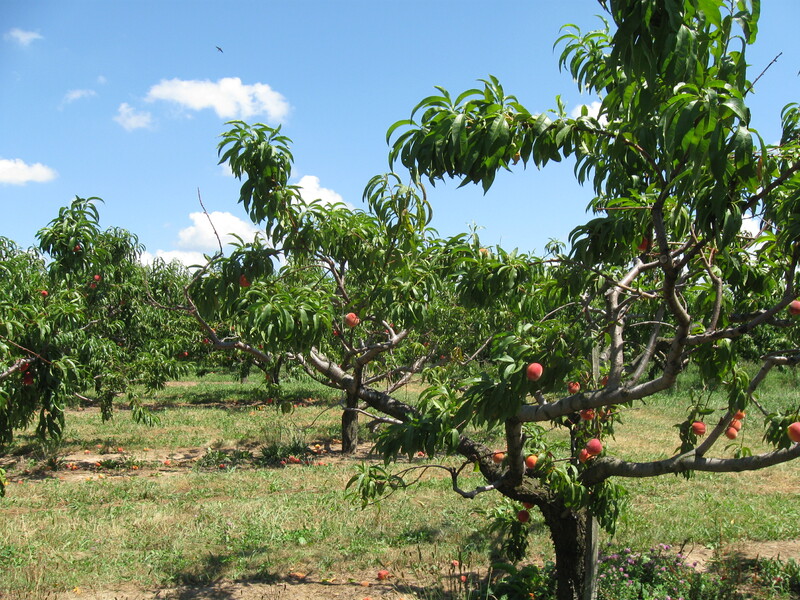 Tree-Mendus is a multi-generational family farm which grows cherries, apricots, peaches, and apples, among other assorted fruits. 6 full cups worth of (about 12 – 14 or so apricots depending on size) fresh apricots, pitted and cut into chunks, and tightly packed all the way to the top of the measuring cup. Rinse off apricots in cold water, then remove the pits and discard. Cut up the apricot fruit (skin on) into chunks that are about ½ to ¾ inch in size. You don’t want to cut them too small, because you want some of those nice hearty chunks of fruit to remain intact in your jam. Place cut up apricot chunks into Dutch oven pot on top of stove and turn the heat to medium-high. Add three cups of sugar and geranium leaves to fruit and start stirring slowly and steadily. Keep stirring constantly. Once the fruit and sugar mixture starts to bubble, add 1 Tablespoon butter or margarine and stir. Remove the pan from heat, cover, and let sit for 30 minutes. After the 30 minutes, remove the cover and return the mixture to the heat. Once the mixture gets to a rolling boil, where the mixture keeps bubbling regardless of whether you are stirring or not at this point, quickly add the entire contents of the pectin powder packet. Keep stirring for one more full minute after you have added and dissolved the pectin powder. Turn off the heat. You may get five full 2 cup jars out of a batch, or a little less depending on how your apricots panned out in the mixture. This post is from one of the interns in the Real Time Farms Food Warrior Internship Program. These interns are collecting data, pictures, and video on the growing practices of our nation’s farms, gathering food artisans’ stories, and documenting farmers markets. We all deserve to know where our food comes from! Boring legalese we feel we must include: this was written by a real live person who has their own opinions, which we value, but that do not necessary reflect, though they may (or may not), the values and opinions of Real Time Farms. That is for you to guess and us to know. This entry was posted in Food Warrior Interns, In the Kitchen (recipes & more), On the Farm and tagged apricot, canning, food warrior interns, jam, Lissa Dysart, Real Time Farms, recipe, rose geranium apricot jam. Bookmark the permalink. Lovely apricots! We are swimming in apricots at the moment 🙂 Fun that you added rose geranium leaves to your jam.